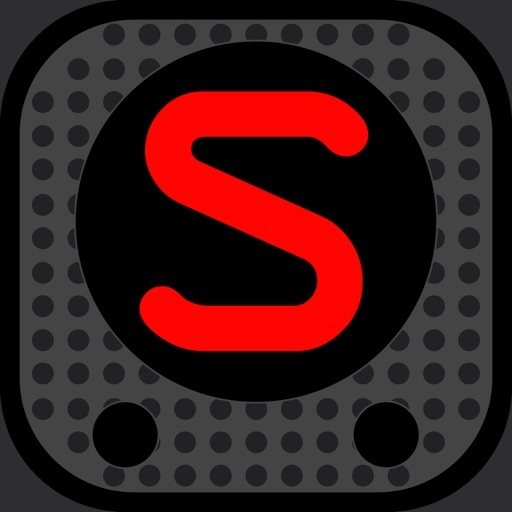 SomaFM's official app, giving you access to over 30 year-round channels of listener-supported, commercial-free, underground/alternative radio, with all music hand-picked our award-winning DJs and music directors. 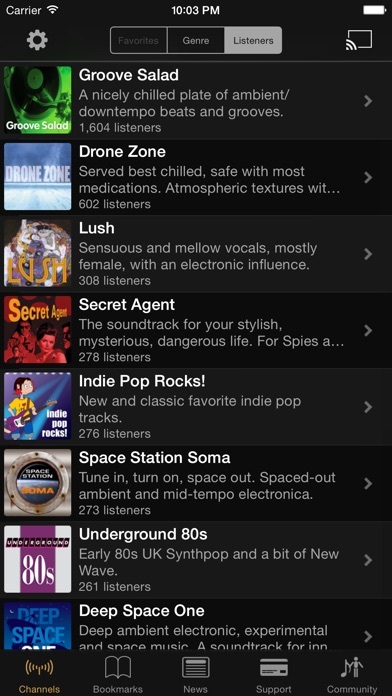 Lifehacker.com calls SomaFM one of the "Five Best Internet Radio Services" and says "completely user and listener-supported, which means no ads or commercials during your broadcasts, and the channels and programs aired at SomaFM are rarely heard anywhere else." - AAC-HE support for highest quality audio even at the lowest bitrates. 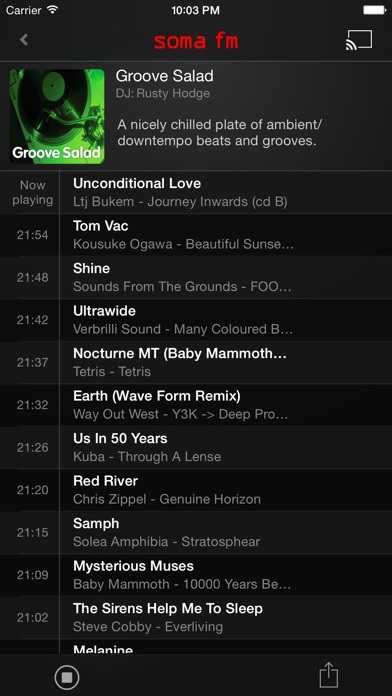 Groove Salad: A nicely chilled plate of ambient/downtempo beats and grooves. Downtempo electronica, mostly instrumental. Great for work. Secret Agent: The soundtrack for your stylish, mysterious, dangerous life. For Spies and P.I.s too! An eclectic blend of cinematic downtempo, stylish lounge, sambas and easy-tempo with an adventurous flair. Fluid: Drown in the electronic sound of instrumental hiphop, future soul and liquid trap. Indie Pop Rocks! : New and classic favorite indie pop tracks. Left Coast 70s: NEW! Mellow album rock from the Seventies. Yacht friendly. The mid/late 70s sound that blossomed out of Los Angeles and spread up and down the west coast. cliqhop idm: Blips'n'beeps backed mostly w/beats. 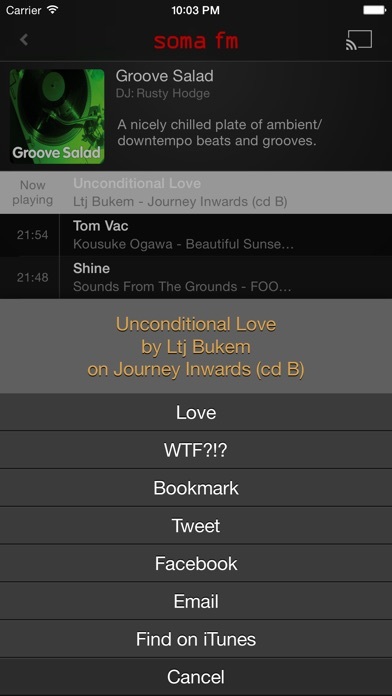 Intelligent Dance Music. Beat Blender: A late night blend of deep-house and downtempo chill. Dub Step Beyond: Dubstep, Dub and Deep Bass. The place for Bass Music! The Trip: Progressive house / trance. Tip top tunes. Illinois Street Lounge: Classic bachelor pad, playful exotica and vintage music of tomorrow. Space Station Soma: Tune in, turn on, space out. Spaced-out ambient and mid-tempo electronica. Doomed: Dark industrial/ambient music for tortured souls. Lush: Sensuous and mellow vocals, mostly female, with an electronic influence. Digitalis: Digitally affected analog rock to calm the agitated heart. Suburbs of Goa: Desi-influenced Asian world beats and beyond. Crafted by Fiona Ritchie, award-winning host and curator of NPR's syndicated Thistle and Shamrock radio show. Underground 80s: Early 80s UK Synthpop and a bit of New Wave, with rarities you forgot you remembered. Sonic Universe: Transcending the world of jazz with eclectic, avant-garde takes on tradition. PopTron: Electropop and indie dance rock with sparkle and pop. Metal Detector: From black to doom, prog to sludge, thrash to post, stoner to crossover, punk to industrial. Mission Control: Ambient and experimental music mixed with the historical sounds of the space program. 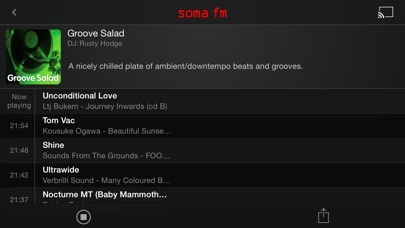 SomaFM SF 10-33: Live San Francisco Fire and Police radio with an electronic music soundtrack. 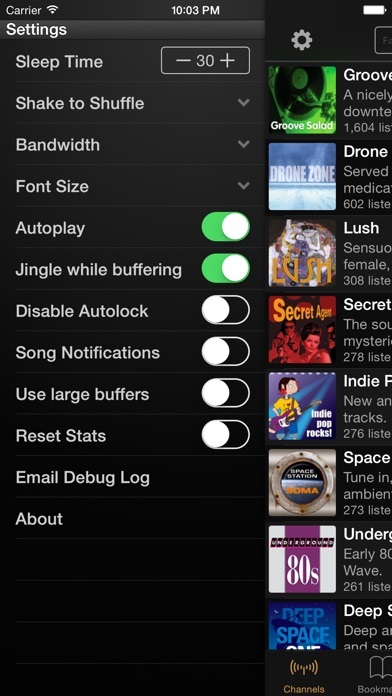 This is the only music I have on my iPhone. Really, REALLY good.